We will need to keep an eye on the weather for Saturday as rain is expected, but as you know in Cape Town anything can change. Either way we will hopefully get to see some waterfalls! 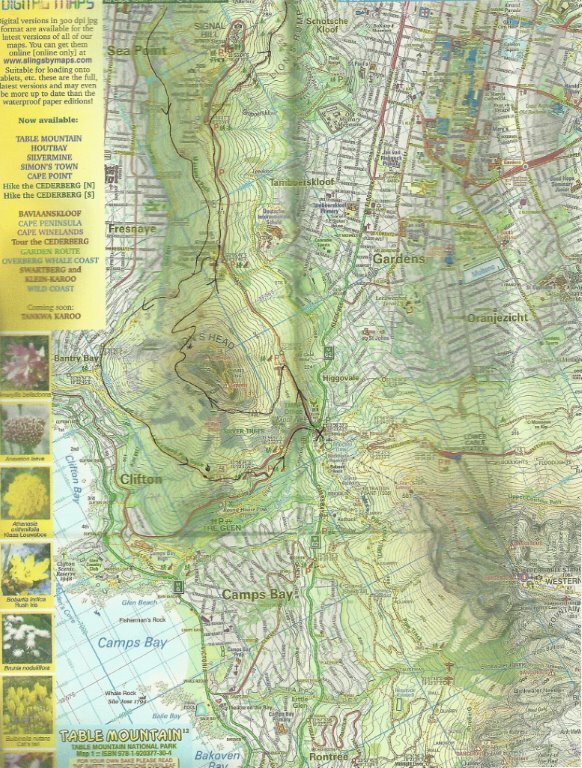 From Rhodes Memorial towards King's Block house via Heartbreak Hill and then descending towards Constantia Nek via Ascension Gulley, Woodcutters and along the boardwalks above Newlands Forest back to the start. RV in the Old Zoo Parking below Rhodes Memorial ready to start at 07:30. The start is a good warm up to Rhodes Memorial, and leads quite far round towards town on jeep track. Heartbreak Hill will take your breath away as we climb almost up to the King's Block House. Once at the turnstile, it's all downhill. Some single track before we meet up with the boardwalks that lead through the trees, passing the waterfalls (hopefully) and forest. Once past the round table picnic spot, we meander again on jeep track towards Constantia Nek, but turn back towards the start to end the run at just about 11kms. From the Rhodes Mem parking lot looking at the mountain we take the top left path and go up. The path intersects with the jeep track but we keep going UP to the upper contour path to the turnstile just below the Blockhouse. Then we turn left and follow the contour path taking care not to take any turn offs up to Ravines or down to Newlands forest. When we get to Skeleton Gorge junction we turn around and come back. Simple. Distance: ±14 kms taking about 2h30 mins. The Medium group will follow a slightly shorter route at a more modest pace. A whistle, water, a warm/waterproof top, space blanket and ICE tag or card. This Saturday we head to Cape Point Nature Reserve. Our route takes us from the Buffelsbaai parking area round Kanonkop and back via the coast. From the BuffelsBaai parking, a brief jog up the road and turn right on to the single track that takes us past the Information hut and up to the top of Kanonkop. Here the fast group can take single track to the left for an out and back jog (turning back as they decide - see map) if they want to add more mileage. The medium group will take go over Kanonkop and down towards the old limestone kiln. Cross the road and head to the path along the coast that takes us back to the Buffelsbaai parking. The park opens at 7am. Please be ready with your Wild Card/My Green Card or R147 (!!) to enter as close to 7am as possible and drive along the road for approximately 8km before turning left at the Buffelsbaai parking sign - park speed restrictions apply. RV in the Buffelsbaai parking - in time to start running at 07h45. The TMNP My Green Card is available exclusively to residents of Cape Town, costs R147 and provides the holder with 12 free entries a year into any of the Table Mountain National Park's pay points: Cape of Good Hope (Cape Point); Boulders Penguin Colony, Oudekraal and Silvermine, as well as to the braai and picnic areas at Tokai, Newlands and Perdekloof. It offers fantastic value. A short run with a hill! Good and easy single tracks with a bit of an uphill slog to the top of Kanonkop. More or less 11 km taking in the region of 1.5 -2.0 hours . To get to Cape Point Nature Reserve go through Simonstown and up Smitswinkel - entrance on left hand side at top of Smitswinkel. Once through the payment gate, drive straight along the road for approximately 8km and turn left to Buffels baai (not Buffelsfontein or Bordjiesdrif...). This week we will return to the Constantia area. This week we will do a gentle Lion's Head - Signal Hill loop from Kloof Nek as many people are doing one of the VWS trails on Sunday. This route has technical sections. We meet in the upper parking lot at Kloof Nek at 6:55 ready to start at 7:00am. From the parking lot we cross Kloof Nek road and run up the tar road till we get to the entrance to the trail on the left. We run along the trail till we get to the start of the Lion's Head walk. Here we turn up and join the walkers going up Lion's Head. As we go up and around with views of the sea, there is a path on the left. We'll take the first path and run around and down towards the Kramat and through to the next parking area. From there we cross the road and take our normal route down, along the fence, down towards the houses and run above them. When the path divides to go right to the top of Kloof Nek, we go straight, down to the road and go up the Glen and home. Anyone wanting a bigger challenge can run up to the top of Lion's Head!